The College Barber Shop didn’t have 25-cent haircuts in 1953 when Ted Olsen put out his barber pole across from Tiffany Loop. But it did offer Seattle Pacific College students, faculty, and staff a convenient, high-quality haircut for an affordable price. Ted was the patriarch of what would become three generations of “barbers” who would serve the Seattle Pacific University community for more than six decades. Following Ted was his son, Lyle, who joined him in 1958. Later, Lyle’s daughter, Lynn, opened her own chair, following in the footsteps of her father and grandfather. In the mid-1960s, Ted, and a co-tenant purchased the current building together, each owning a half. Tenants included a dry-cleaning business, the barber shop, and a small sundries store. 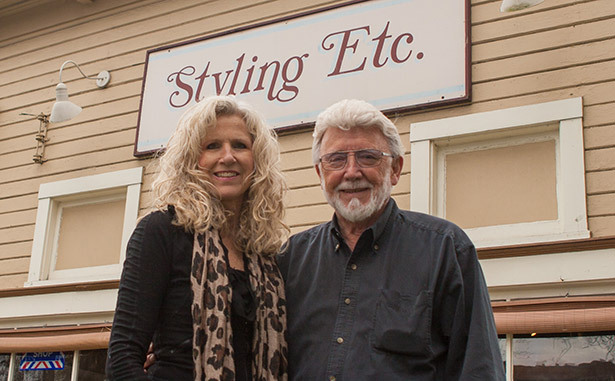 In 1975, Lyle expanded his space into the sundries store, and Lynn joined him in 1984 — the College Barber Shop had morphed into Styling, Etc. (Lyle) and Best Image Salon (Lynn). In the early years, Ted and Lyle offered crew cuts, buzz cuts, and some “Ivy League” styles for customers who still preferred a comb. The shop was open six days a week on a first-come, first-served basis. Later, when Lynn’s salon was up and running, appointments were introduced, which eliminated the room full of customers waiting for an open chair. The combined business generated by the two stylists prompted Lyle’s wife, Mary, to assist in handling phone calls and appointments. Prior to becoming a barber, Lyle worked for Seattle City Light and attended Folks Barber College in his off hours. In the mid-1960s, the British Invasion impacted barbers across the nation. The Beatles emerged, short hair disappeared, and many barbershops closed because they couldn’t adapt. Ted and Lyle survived by learning to cut and style longer hair. Patrons of the College Barber Shop, and later Styling Etc. and Best Image, have always included a wide range of SPU students, faculty, staff, and their families. From the early years, Lyle can count at least 49 professors who called him their barber. The shop’s customer list also included Seattle Pacific patriarchs like C. Dorr Demaray, Philip Ashton, C. Hoyt Watson, Otto Miller, Roy Swanstrom, Mel Foreman, and many more. Current SPU faculty who cross the street for their haircuts include Eric Hanson, Bill Woodward, and George Scranton ’69. During his tenure, Lyle’s love of athletics forged a common bond with Seattle Pacific athletes and coaches of all sports. Falcon Hall of Fame basketball players such as Loren Anderson ’59 and Howard Heppner ’66, and long-time coaches Les Habegger, Frank Furtado ’57, Ken Foreman, and Cliff McCrath all called Lyle their barber. Lyle’s support of SPU goes beyond athletics, however. He’s also a donor to the University, joining the President’s Circle this year. And even though they graduate or retire, Lyle’s customers keep coming back, like Frank Cranston ’56. Ted Olsen was his barber. “He always had a new story to tell,” recalls Frank. “He also had a great tenor voice and loved to sing in church choirs, including the one at Ballard Free Methodist Church.” When Ted retired, it was natural for Cranston to keep coming to Lyle.